A pair of slipper chairs with mahogany bases. Designed by Edward Wormley for Dunbar. 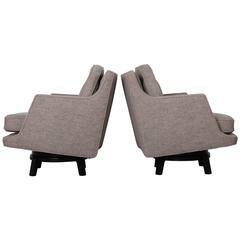 A pair of slipper chairs with mahogany bases and Maharam wool fabric. Designed by Edward Wormley for Dunbar. Smartly restored in a gorgeous fabric. 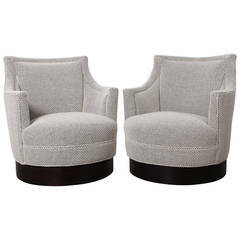 Pair of slipper chairs by Edward Wormley for Dunbar. 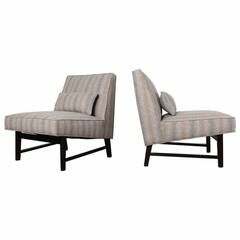 A pair of stylish lounge chairs design by Edward Wormley for Dunbar. Original upholstery. Both retain Dunbar metal tags.